It seems that no matter what array of fancy deserts are prepared at Christmastime, the good old fashioned Christmas Strawberry Trifle is the one that everyone chooses to eat first. 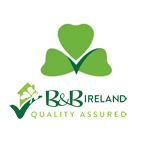 Farmhouse B&B hosts are renowned for their fabulous baking skills and know what their guests love to eat at this time of year. This Christmas recipe is so easy to make and everyone just loves it. Try it yourself this Christmas! Needed: 9 inch wide x 4.4 inch deep trifle dish. Dissolve one packet of jelly cubes in a heatproof measuring jug using a little boiling water. Now add enough cold water to make the liquid up to 1 pint / 500mL. Slice the trifle sponge into thick pieces and place in the bottom of you trifle dish. Wash and half the strawberries and scatter them around the sponge in the trifle dish. Now pour your jelly into the trifle dish to cover the sponge and strawberries and let it set in the fridge. Put 2 tbsp of custard powder and 1-2 tbsp of sugar into a bowl. Mix into a smooth paste with a little milk taken from one pint of milk. Heat the remaining milk to nearly boiling and pour onto the custard mix, stirring well. Return to the saucepan and bring to the boil over a low heat, stirring continuously until it thickens. Once the custard has cooled ladle it onto the set jelly in the trifle dish. Put back into the fridge. Whip your carton of fresh cream with an electric mixer until firm. Ladle the cream on top of your custard and use a fork to create peaks. 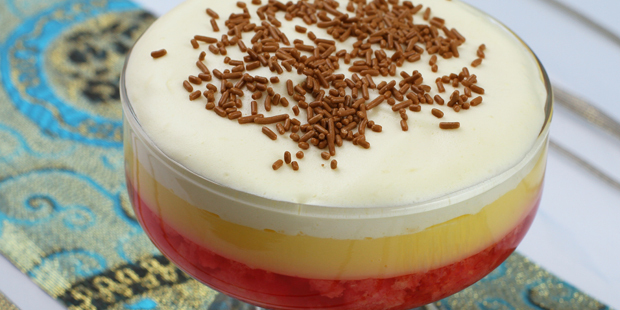 Crumble your chocolate flake on the top of the cream and your trifle is complete. Keep the trifle refrigerated until you are ready to eat!